We have numerous options and variations. Please discuss complex plug rating issues with our engineering department. Unshrouded 2mm plug. Supplied unassembled. Mates with S18 socket. Rated 30V AC, 60V DC, 10A maximum. Shrouded 2mm plug. Supplied unassembled. Mates with S18 socket. Unshrouded 2mm plug. Supplied unassembled. 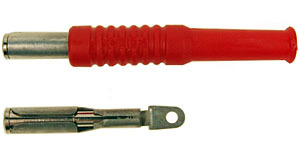 CL1466 Probe for P12 or P13 2mm plug. CL1470 P12 or P14 cover in black. CL1471 P12 or P14 cover in red. 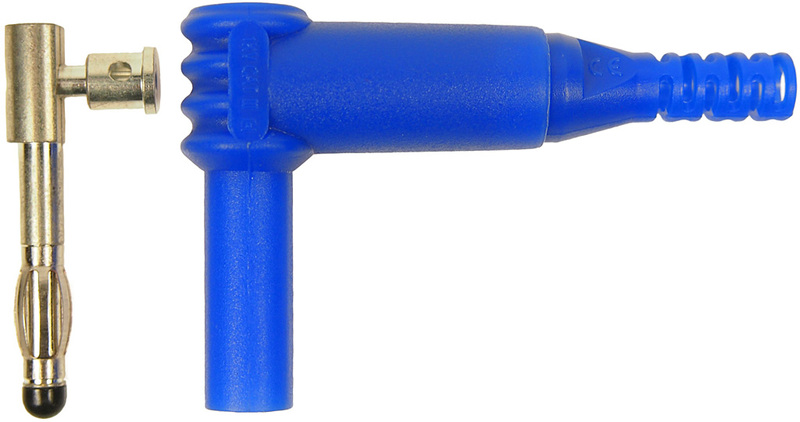 CL1472 P12 or P14 cover in blue. CL1473 P12 or P14 cover in green. CL1474 P12 or P14 cover in white. CL1475 P12 or P14 cover in grey.gray. CL1476 P12 or P14 cover in brown. CL1477 P12 or P14 cover in yellow. CL1480 P13 cover in black. CL1481 P13 cover in red. CL1482 P13 cover in blue. 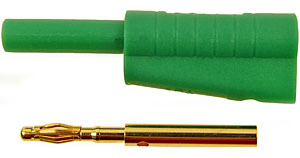 CL1483 P13 cover in green. CL1484 P13 cover in white. CL1485 P13 cover in grey.gray. CL1486 P13 cover in brown. CL1487 P13 cover in yellow. Unshrouded 4mm plug. Supplied unassembled. 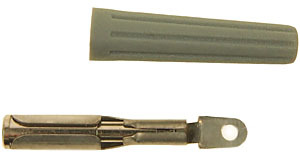 CL1468 Probe for P14 or P15 4mm plug and pin. CL1490 P15 cover in black. 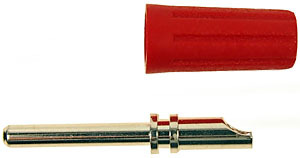 CL1491 P15 cover in red. CL1492 P15 cover in blue. 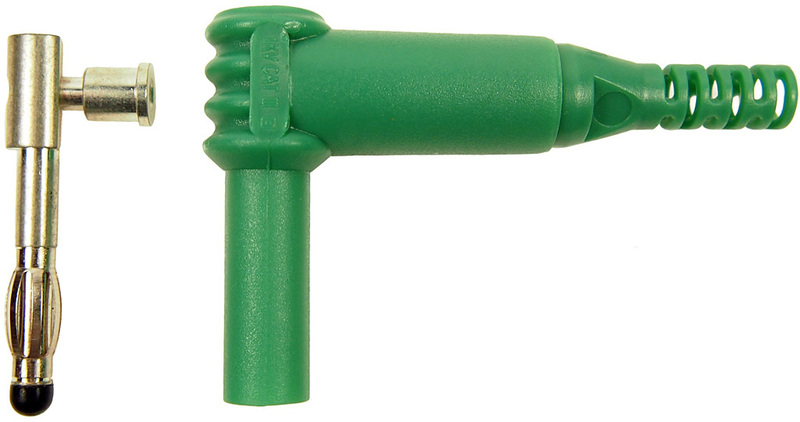 CL1493 P15 cover in green. CL1494 P15 cover in white. CL1495 P15 cover in grey.gray. CL1496 P15 cover in brown. 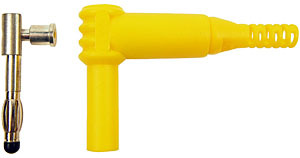 CL1497 P15 cover in yellow. Shrouded 4mm nickel plated plug. Can be with or without rating. Rated 1000V, 10A maximum, CAT III. 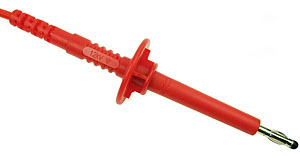 P14X has different model codes depending on the product marking. CL14891 P14XA (no marking) in black. CL14892 P14XA (no marking) in red. CL14893 P14XA (no marking) in yellow. CL14894 P14XA (no marking) in brown. CL14895 P14XA (no marking) in blue. CL14896 P14XA (no marking) in grey.gray. CL14897 P14XA (no marking) in green. CL14891M P14XX (Cliff™ marking) 1kV CAT II in black. CL14892M P14XX (Cliff™ marking) 1kV CAT II in red. CL14893M P14XX (Cliff™ marking) 1kV CAT II in yellow. CL14894M P14XX (Cliff™ marking) 1kV CAT II in brown. CL14895M P14XX (Cliff™ marking) 1kV CAT II in blue. CL14896M P14XX (Cliff™ marking) 1kV CAT II in grey.gray. CL14897M P14XX (Cliff™ marking) 1kV CAT II in green. 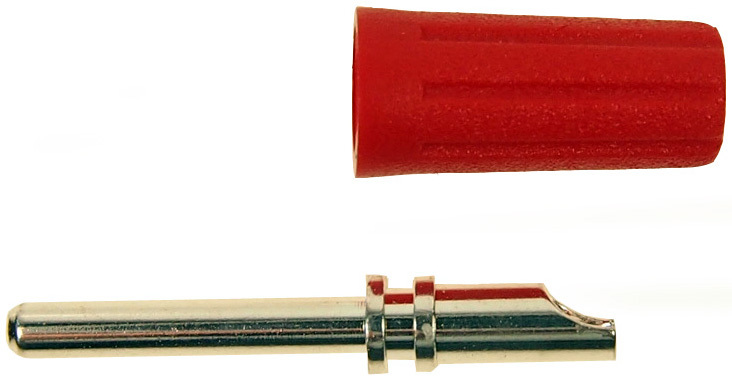 4mm nickel plated plug with retractable shroud and cable restraint collet. Rated 1000V, 10A maximum, CAT II. 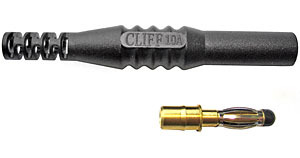 FCR6381B P14XASR 4mm Cliff™ plug in black. 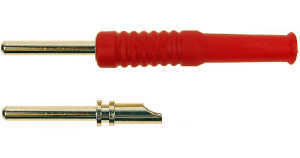 FCR6381R P14XASR 4mm Cliff™ plug in red. 4mm nickel plated plug with fixed shroud and cable restraint collet. 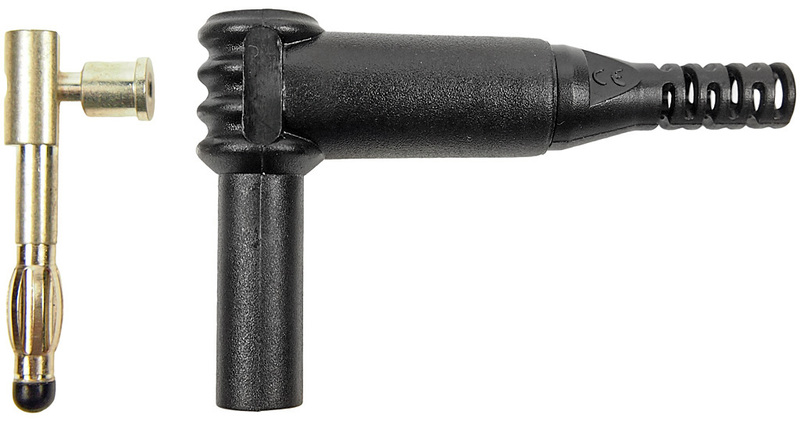 FCR6361B Cliff™ touchproof plug in black. 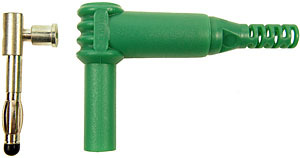 FCR6361G Cliff™ touchproof plug in green. FCR6361L Cliff™ touchproof plug in blue. 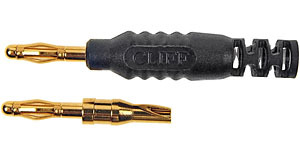 FCR6361N Cliff™ touchproof plug in brown. 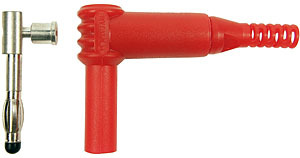 FCR6361R Cliff™ touchproof plug in red. FCR6361Y Cliff™ touchproof plug in yellow. 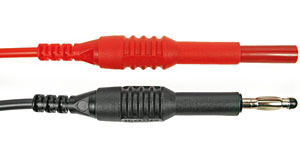 Special connector for HV testing. 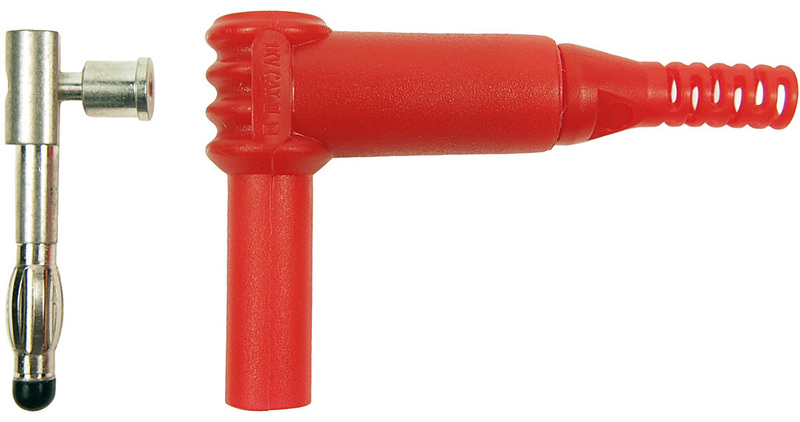 Rated 5, 10 or 12kV for HV applications. Not intended for mains use so no CAT rating.